“Got it,” responded Baker Bloch. My Ash(e)ville may earn the nickname of Little Chicago through this. It has a very large downtown for a city its size. And then for other reasons I change its name to Middletown later on. Chicago is in the middle of the US, in the Great Lakes region. 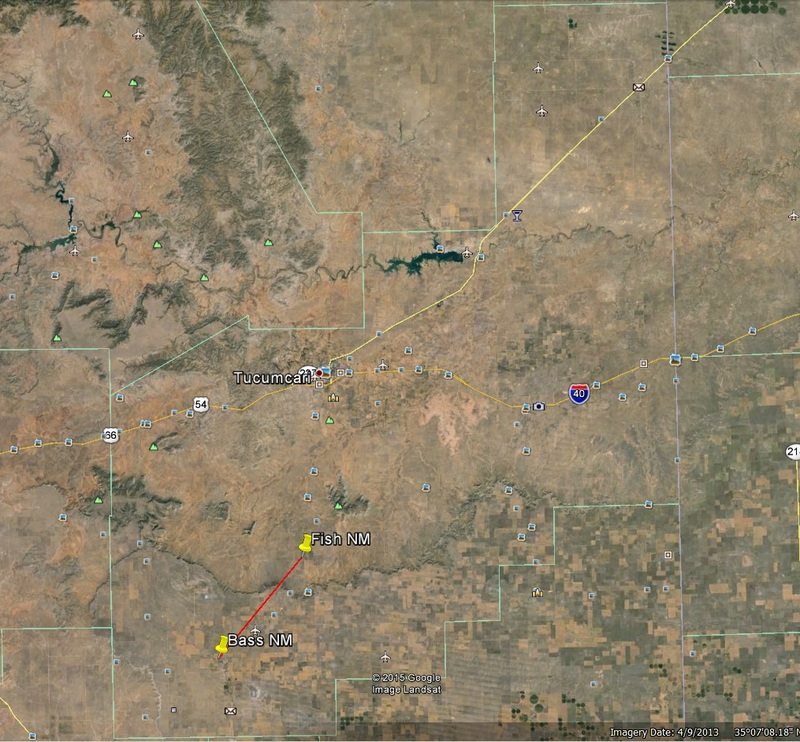 Carolina and Wyoming are also both in Washington County in Rhode Island, and so both make types of triple state name as well (Carolina, Washington, Rhode Island and Wyoming, Washington, Rhode Island). 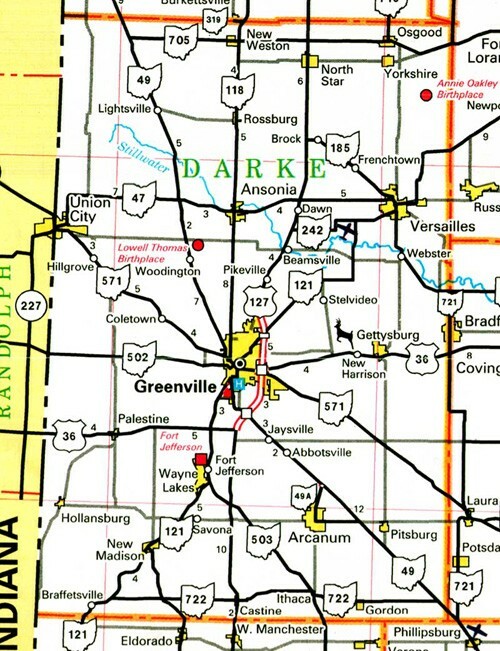 Largest “Ashville”, by far (Ash(e)ville/Middletown), is located in (North) Carolina. Wyoming in Iowa County in Wisconsin state probably makes up the most profound or central triple state name of this kind, and may additionally highlight Wyoming RI here. It brings to mind this: Are there any towns in counties and states of the *same* name (as opposed to all different names). This would be a triple state redundancy, then, and the opposite of all three having different names. 1) *Part* of New York City (basically Manhattan) lies in New York county in New York state. 2) *Most* of Oklahoma City lies in Oklahoma county in the state of Oklahoma. Returning to Ashville OH, we can perhaps extend our range through understanding that a city named Circleville is the county seat and largest burg of inclusive Pickaway County. 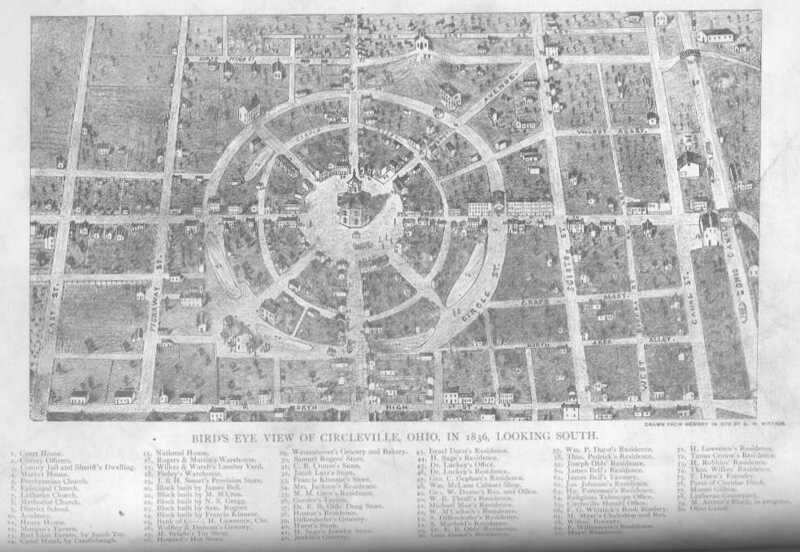 Circleville was unique among early American towns, built to conform to a circular prehistoric earthworks. 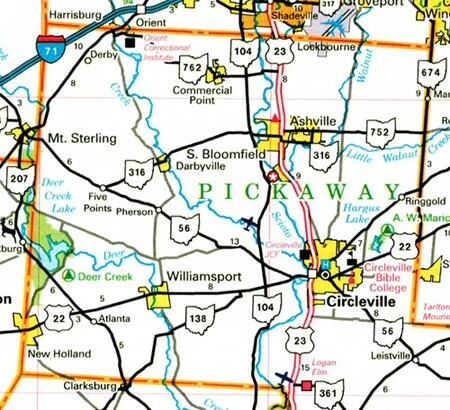 When Pickaway County was formed in 1810 there were no existing settlements that seemed suitable for a county seat. 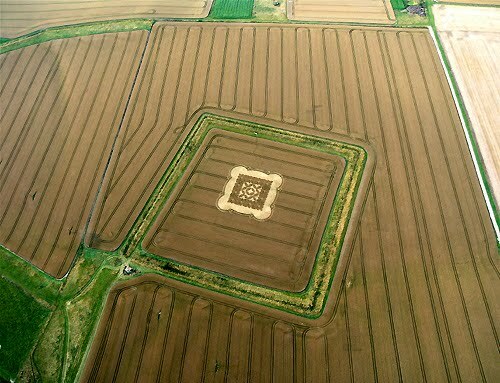 Therefore, a new town was laid out within the ancient’s “circle” on the high bank east of the Scioto River. 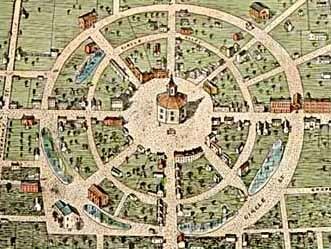 It’s streets radiated from an octagonal courthouse in the center of the circle. 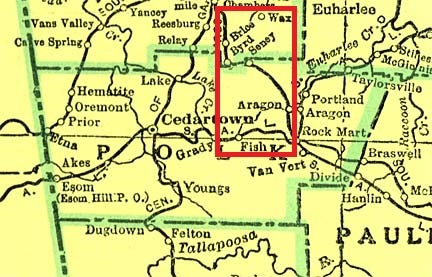 Two communities existed near Circleville prior to its being laid out as the county seat. Jefferson and Livingston ceased to exist several years after Circleville was designated the seat of government in 1811. 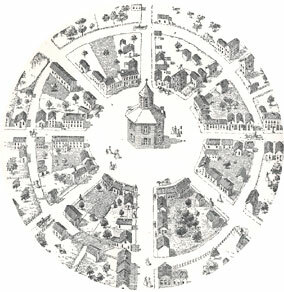 When the Ohio Canal reached Circleville, the shape of the town within the circle proved to be a hindrance, and in 1838 a group of enterprising businessmen began to “square the circle”. 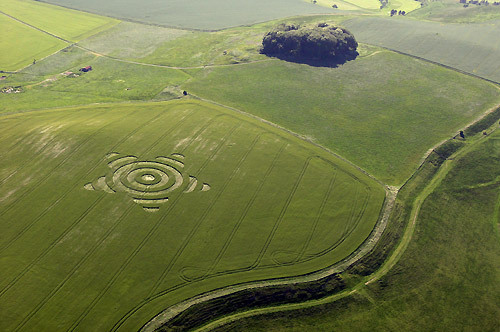 Over the next 20 years the job was accomplished and all traces of the ancient earthworks disappeared. 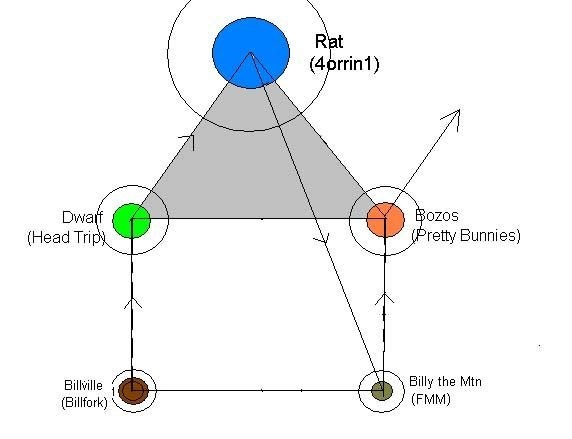 The concept of “squaring the circle” spoken about in the above excerpt has also come up recently in this blog in connection to the Moon of the Moon, except there the process was reversed: Jack and Lily *circled* (or “sphered”) the square (or “cube”) that was the Moon of the Moon by creating a world ocean and introducing omni-directional gravity. 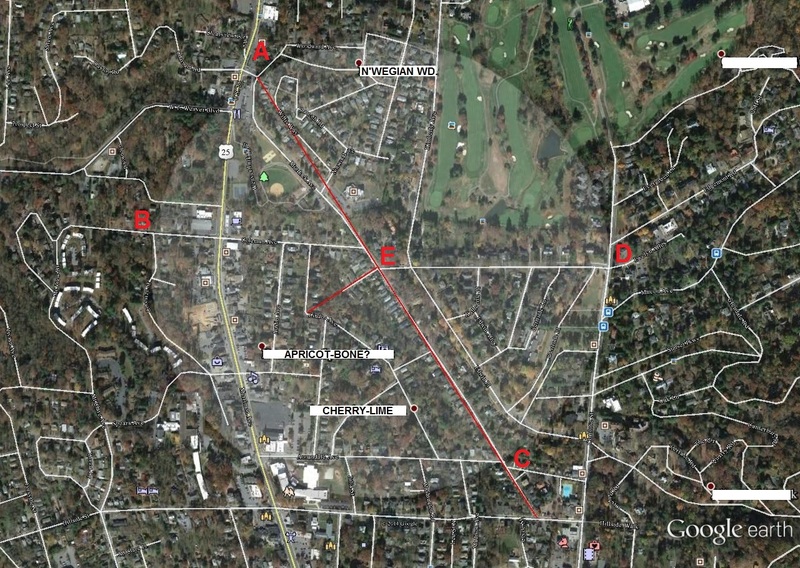 And in a more limited way I’ve done a similar thing with Ash(e)ville/Middletown through what I call the Middletown Circle, introduced on this blog back in Winter 2014/2015. This is also the point where I decided to rename Ash(e)ville as Middletown, invoking what appears to be an older matrix. 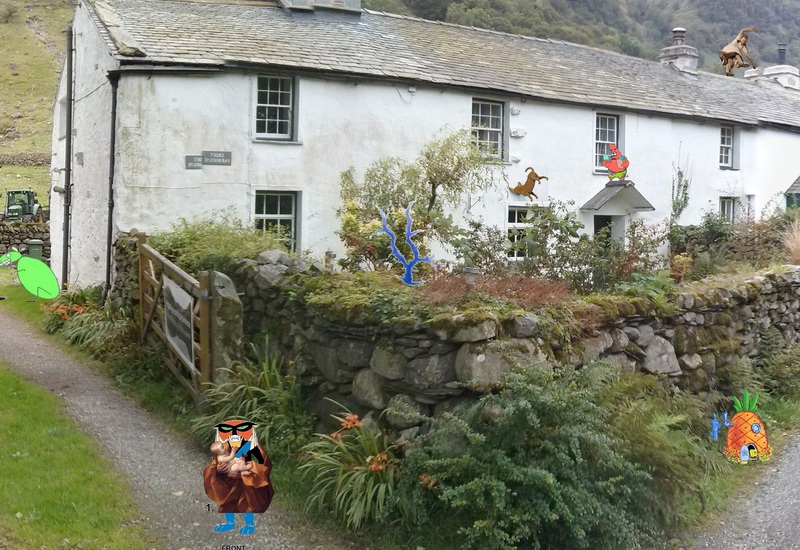 In part two of Collage 10, now called “Holey”, we see two namesake types. First is an actual hole — or half hole, really — that appears on the ground before a now leaning 12 Oz Mouse on the far left side of the collage. 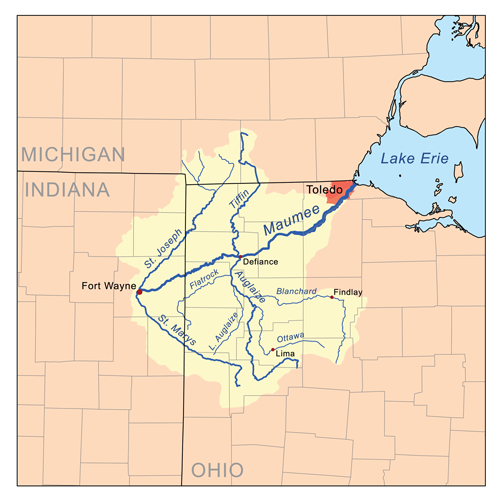 In this same post we have a picture of the Maumee River basin, this stream formed by the conjunction of St. Joseph and St. Marys rivers at Fort Wayne, Indiana. You can see why I associate it with Jesus, then. 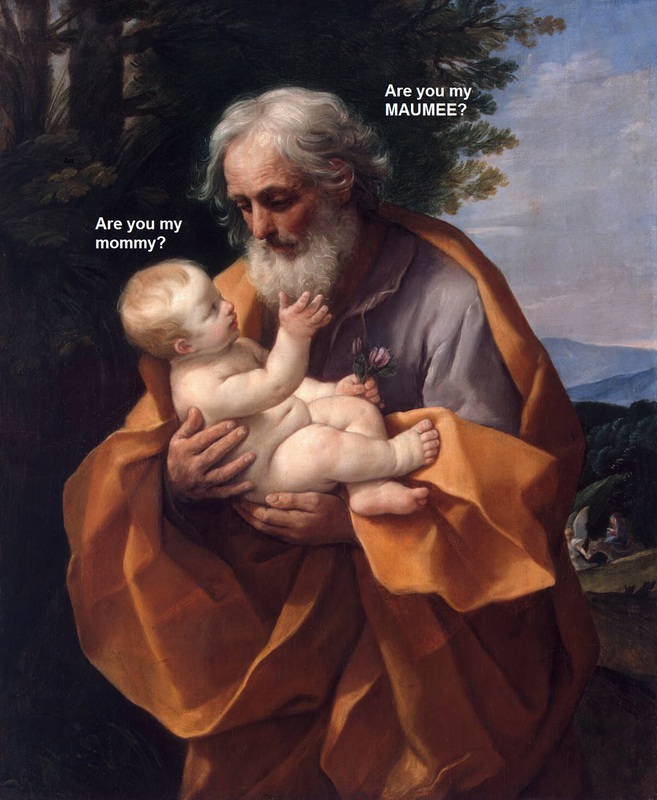 The Holy Infant confuses his father for his mother. He is just a wee lad, not much removed from tadpole status. But is this his father, see? Isn’t God the Father? And so forth. So these 2 “holeys” appear on the left side of Collage 10, defining the tone of the picture reading it from left to right. The Maumee River basin has showed up in a prior Stonethrow collage, or Collage 06 (“Beware (The) Heelers”), part 02 of the 2 section animation to be exact. 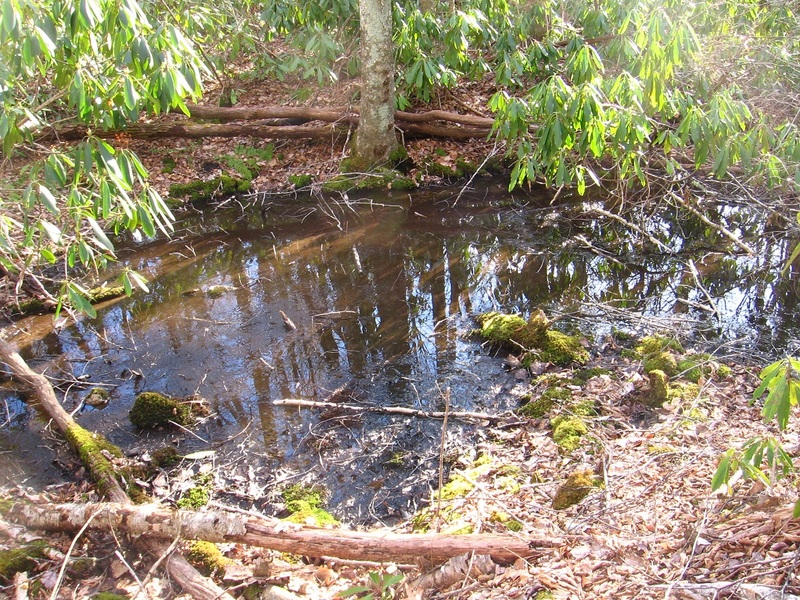 There it’s covered by what’s called the Great Black Swamp, drained in the early to mid 1800s by settlers to the area. You can again see Fort Wayne to the left and Toledo, at the Maumee’s mouth, to the right. The whole of the Maumee River was apparently submerged in or made one with this giant, dark marsh before the Great Drain. Very peculiar — and I didn’t know about this swamp until several months after creating that October post. I had other reasons to be drawn to that area (Rainbowology). 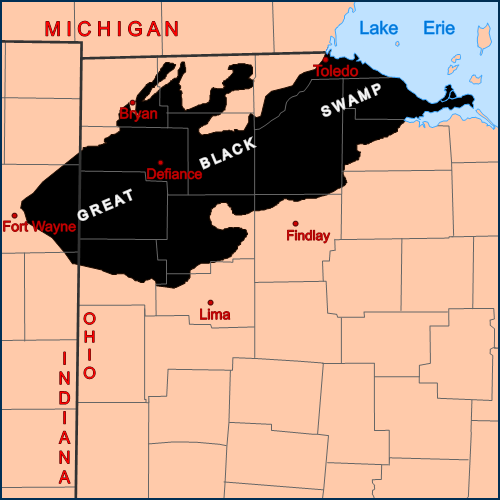 The image of the Great Black Swamp here covers the word “The”. The second part of the Collage 06 animation becomes just “Beware Heelers” instead of “Beware The Heelers” of part one. Collage 06 also contains a number of other Rainbowology elements, including Dorothy Gale, the Witch Mombi, and Ozma, all characters from Baum’s Oz mythology later found in the movie “Return to Oz”, the base for the earlier carrcass “SID’s 1st Oz” from 2002. The basic point of Collage 07 is that Ozma as true ruler of that fantasyland is able to symbolically drain the Great Black Swamp again by reversing Dorothy’s Fall highlighted in “Dark Side of the Rainbow”. This is the same as Dorothy (and Oz itself) being saved by TILE, a religion that has replaced X-ianity for me by becoming as much a philosophy and a board game as a religion per se. “Per se, Hucka D.” (pause) Not there. 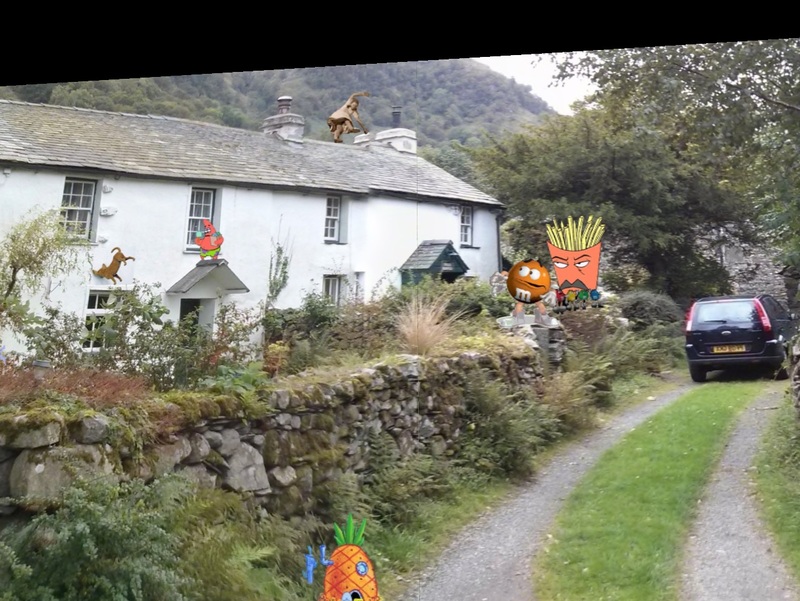 And then on the *right* hand side of Collage 10 we again have the image of Dorothy falling off that confounding pigpen fence, animated this time. 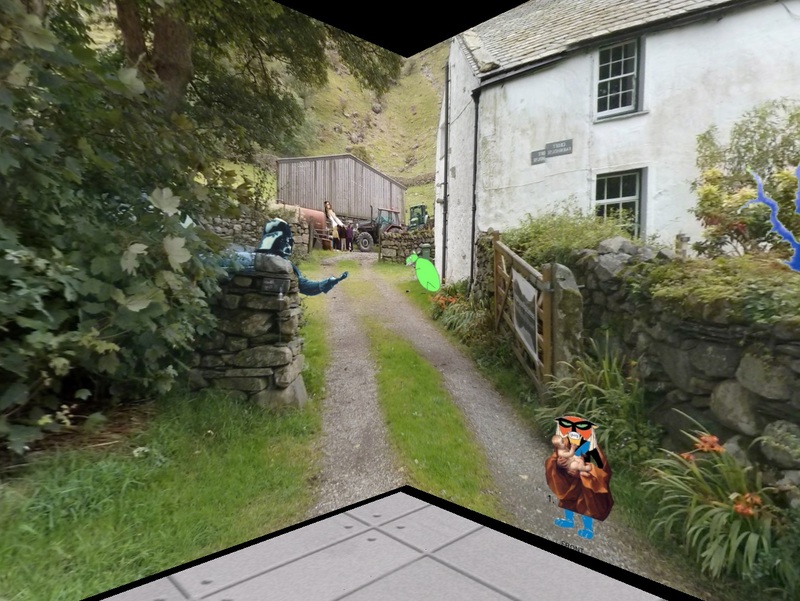 The second animation (below picture) shows Dorothy more in the actual state of falling, and this image again directly comes from Collage 07. The first Dorothy (above picture) is more in the process of losing her balance on this fence, causing the fall. “But through the magic of the collage, she instead falls off the roof of this white house, Hucka D.” (pause) Hmmm. 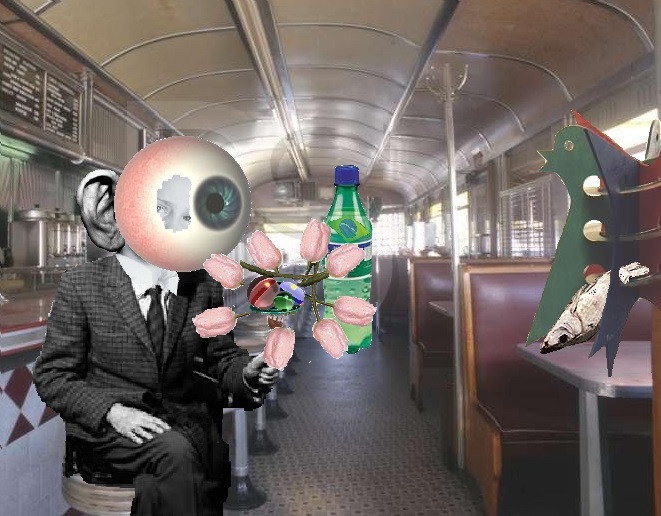 This time we must now move quite yet into an interpretation of your Collage 11 beyond Collage 10 but focus on the latter. And good morning to you. 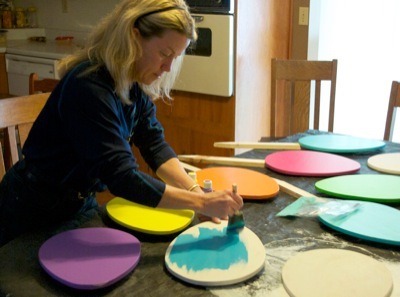 … of a difficult and complex work. But it’s not that complex. Just keep your thumb next to the line you next recite and you’ll do fine. Stick to the [already written] script, eh. Precisely. Now what are your next lines? Because you’re next up. No. Read the line to the *left* of your thumb instead of the right. You’re always confusing those directions. At least you usually get up and down right the first time. Or is it left? We must focus on the White House. Good. You’ve already established a racist lives there and that racist is Brak The King from Temple Farm, Marlborough, as featured in the Baker Bloch Heads To England exhibit from 2010, I believe. Blochhead. Bloch-head. But you’re also saying that Brak represents the great loser state of Arkansas, or perhaps he hails from there. And you’ve always told me, ever since the beginning of my blogging days in the old Baker Blinker one, that Arkansas is the center and the focus and not let my attention stray too far north. Or *up*. Down is where it’s at, yes. I can’t see that far down. Thank you[ for showing me the whole picture]. “Holey”. 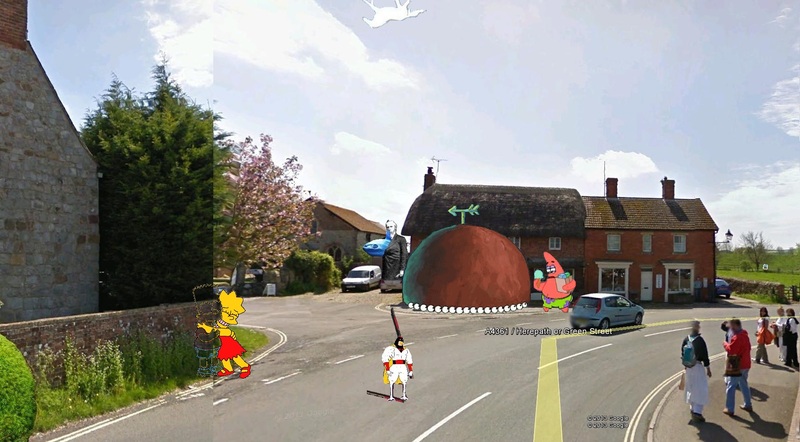 Patrick Star appeared in the Falmouth tetraptych that completed the 2013 Gilatona-Lis sequence of collages, Hucka D.
Well, here he is in case you’ve totally forgotten. Thanks once more. But if you’re going to rezz that whole [older] tetraptych then we’re going to have to stand back a bit. Then I won’t do that. 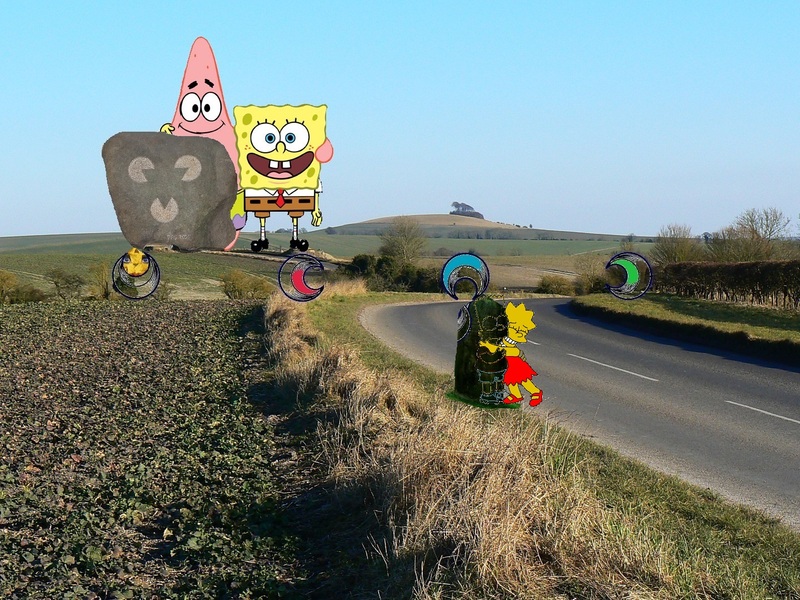 And Spongebob also showed up in earlier Gilatona-Lis works. 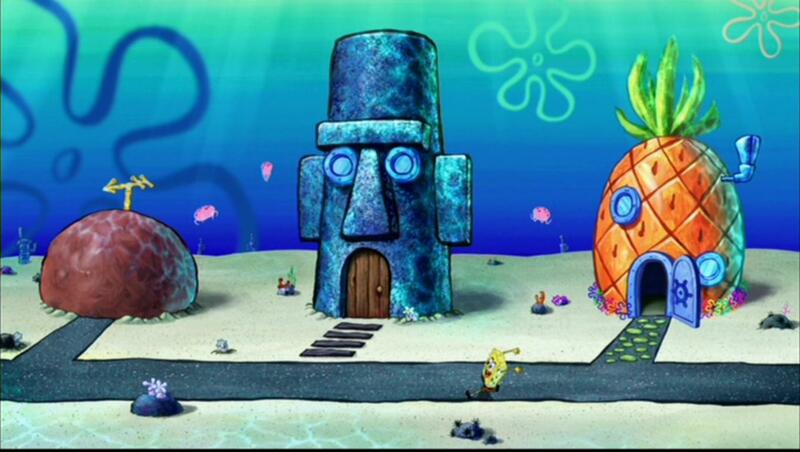 And his pineapple home appears in the original Embarras collage (Embarras 01). “Why?” I hear you asking in your mind. Well, to give the collages a bit of levity for one thing. The dog flies into the white house and becomes stuck like in flypaper. I must ask you: is this dog Spider? Carrcassonnee’s Spider that still sits in the Collage Temple beside his master, still spouting out the permutations of that hellish number 2130? He’s not exactly the same color but it does appear to be a Chihuahua of similar shape and size. And Patrick Star hates Spiders — that’s another connection. … until Gene Fade reaches fabled Red Head and builds a dwelling place on the “northern” shore and calls it Neptune (or North Star). All that was unseen becomes seen with (one of his biographies), entitled “By Neptune’s Beard!”. Neptune becomes the outermost planet of our Solar System starting in 1846. It is the only one that cannot be C-een by the naked eye. It becomes a symbol of the darke night sky, then. Carrcassonnee. Beyond the planets and into the darke night: stars. All revolves around North. North Star was platted in 1852 along the road between Greenville and Celina, approximately midway between the two cities. 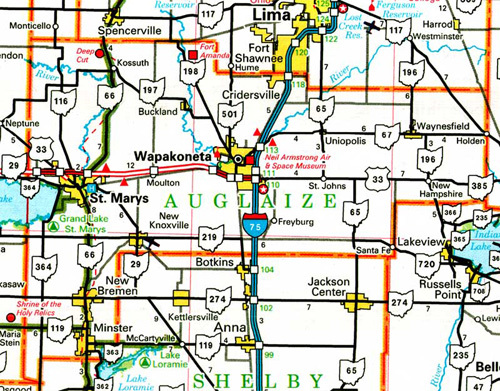 Its name was derived from its location on the edge of the Great Black Swamp, as it was the northernmost point in Darke County that was not wetland. The Great Black Swamp is The Abyss, the static nothingness of the Universe all around us and through us and into us. Only TILE saves. TILE is the effect of the C-een planets on the nothingness. Tennessee. But then, beyond TILE is Still(water) and beams of light. Charles Ives” “The Cage” with lyrics. Annie Oakley is from North Star. Annie Oakley (August 13, 1860 – November 3, 1926), born Phoebe Ann Mosey, was an American sharpshooter and exhibition shooter. Oakley’s “amazing talent” led to a starring role in Buffalo Bill’s Wild West show. Her timely rise to fame allowed her to become one of the first American women to be a “superstar“. 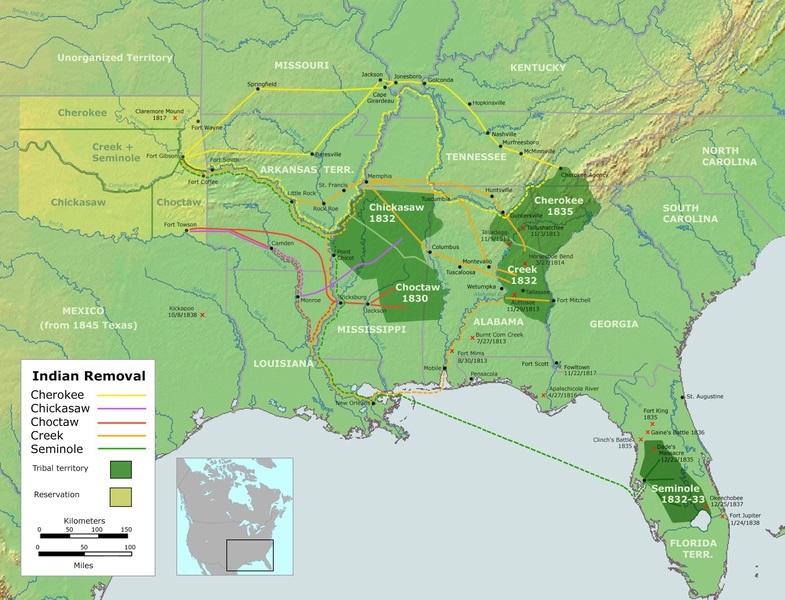 In the 1850s the states began an organized attempt to drain the swamp for agricultural use and ease of travel. Various projects were undertaken over a 40-year period. Local resident James B. Hill, living in Bowling Green, Ohio, in the mid-19th century, made the quick drainage of the Black Swamp possible with his invention of the Buckeye Traction Ditcher. Hill’s ditching machine laid drainage tiles at a record pace. The area was largely settled over the next three decades. The development of railroads and a local drainage tile industry are thought to have contributed greatly to drainage and settlement (Kaatz, 1955). A follow up to LINK. (4 c’s and an s (Seminole)). that I created just for this purpose. as much as you want to about it, and I’ll check up on it more myself. some way, perhaps to inner planets Mercury, Venus, Earth, Mars. presence of a town called Neptune nearby, just to the NE of Celina. connection with the 1846 founding of Maria Stein. Okay, I’ve read that post, although I’ll have to study it more later. this further when I have more time, believe you me. and Coldwater Jupiter, since Saturn is close to Neptune. …and there are six *C* towns here. naked eye, on a clear night and if you know where to look. planets, although they may be implied indirectly, as I’ve indicated. Pluto is even more invisible. nun Maria von Trapp of Sound of Music fame into the, um, picture. b_hive… all this is a continuation of some kind. concept also connected here, obviously. though. I’ll try to think about a model further. the actual name of the planet here on the map). a b_hive on this board)? 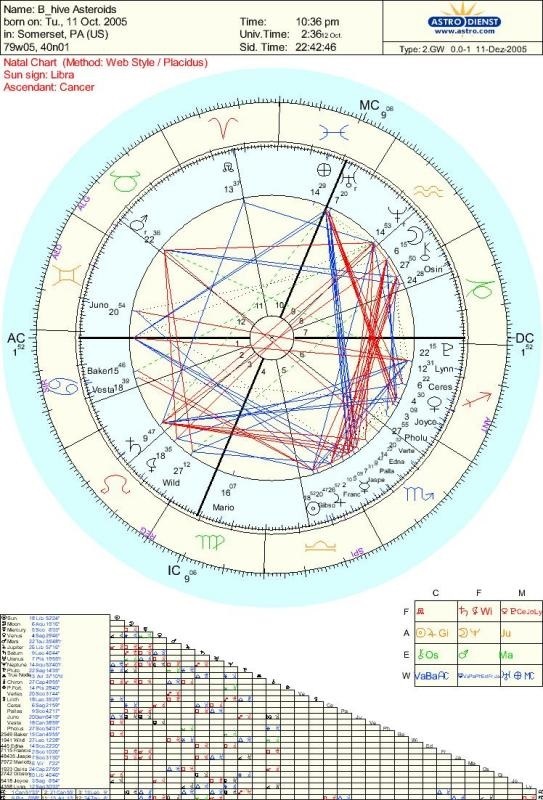 diagrams I created before? Less sense? More sense? Less synchy? More? 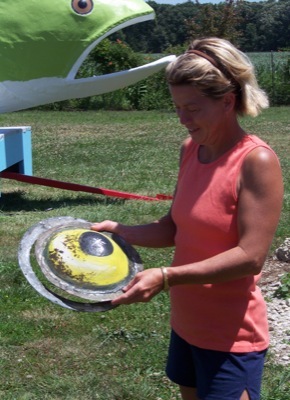 Another article with Brenda Robinson, painter of the Quilted Rock. This time she helped restore Big Bob, claimed to be the world’s largest handmade bass. When the Griswolds were done painting, Robinson applied a final clear coat to protect Big Bob from the elements. “I bet he’s good for another 50 years,” Griswold said. The fish was built to advertise Celina and Grand Lake, with many Lake Festival queens riding on the float in the past. More recently members of the Celina Dolphin swim team have enjoyed a ride on the float during the Lake Festival parade. According to a 1976 Celina Lake Festival brochure, the current Big Bob is not Celina’s first whopper of a fish float. Apparently, in the 1930s, a 30-foot-long fish float was built by Celina businessmen to advertise Grand Lake. 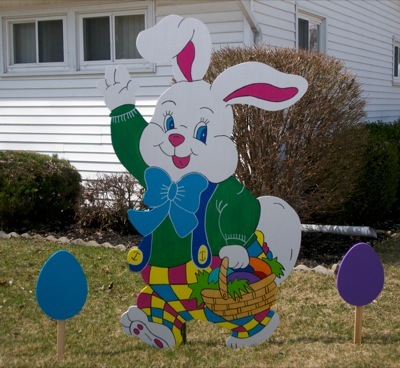 The float appeared in numerous parades and events throughout Ohio, Indiana and Michigan. The float was to be a part of the famous Parade of Roses in Pasadena, Calif., but was destroyed when it was loaded for the parade and never reached its destination. The disheveled fish then was put on a small island in Grand Lake off West Bank Road where it sat for many years as a tourist attraction, the brochure says. “One Pink” (Greenup collage #11). 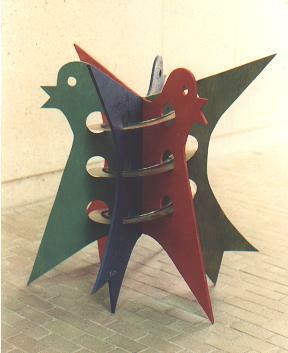 I just took apart the sculpture of the red/green/blue birds seen in the above collage (Opus 19) to make room in my study for the new keyboards (Baby Chro). One replaces another in effect. Fish+Bass in Quay County, NM. I believe the shallow pool of water at the lower end of Red Head may now be called The Grand or Grand Pool or something equivalent. Model: Grand Lake, Ohio, also very shallow. More on Grand Lake and its Mercer County soon enough. Thanks! 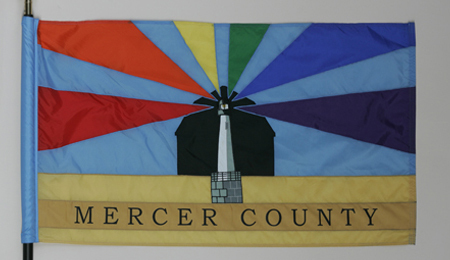 Mercer County is our Solar System. We stopped on the way back home to get a closer look and take pictures. 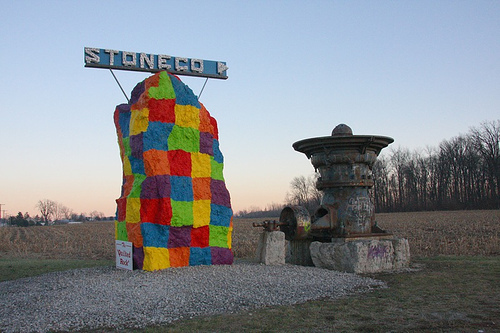 I contacted Stoneco—actually a company called Shelly that acquired the Stoneco quarries some years ago—to ask about the origins of the rock. I was told the rock had been placed to mark the northwest corner of the property that housed Stoneco in that location, but it had been a magnet for graffiti. A local artist, named Brenda Robinson, offered to paint the rock in a quilt-like design in order to discourage the vandalism. And, apparently, it worked, as the Shelly representative had no knowledge of any further defacement. And that’s all there was to it. Frankly, I was a wee bit disappointed. I was hoping for something that involved a jilted lover, a family feud, and a ghost that haunts the grinder thingy next to the rock. So, what do you think? Tell us what your story would be for the origin of The Quilted Rock. Maybe we can get Stoneco to go with one of ours instead. The lighthouse signifies Grand Lake, the largest man-made lake in Ohio. Beams radiating from the lighthouse stand for all six Mercer County schools: red for St. Henry, orange for Coldwater, gold for Parkway, green for Celina, blue for Marion Local, and purple for Fort Recovery. The flag committee added one final touch to the design. The foundation of the lighthouse was modified to have fourteen stone blocks. Each block represents one of the townships. But I wonder if a map like this could have possibly served as an inspiration for the colored Quilted Rock patterns.